Orange Chocolate Chip Cake Batter cookies are a delicious variation of the tradition chocolate chip cookie. An Easy DIY recipe tutorial idea. Do you like the combination of orange and chocolate? It is one of my favorites! Not too long ago I found a recipe for Cake Batter Cookies on Pinterest made by Mommy Hates Cooking. Over the weekend I was in a baking mood and decided to give them a try. To the original recipe, I added some orange extract and it totally makes the cookie! Yum! They are so good! Click here for a printable PDF version of this recipe. Preheat the oven to 350*. 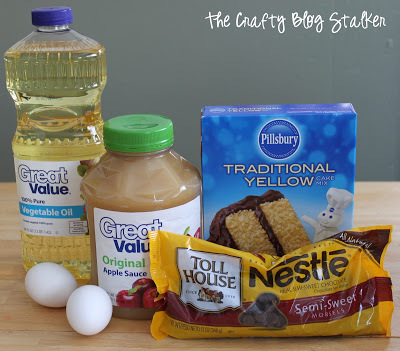 Mix the orange extract, oil, apple sauce, and eggs and then mix in the cake mix. Add chocolate chips and mix well. IMPORTANT: Let the dough chill for several hours.It will be easier to work with, and the cookies will be fluffier. Drop the dough on greased cookie sheets in tablespoonfuls. The picture on the left is right after everything has been mixed, the picture on the right is after the dough has chilled for several hours. Can you tell the difference already? Drop the dough by spoonfuls onto a greased cookie sheet and bake. They come out smelling AMAZING and looking oh so tasty! The combination of chocolate and orange is just right, and the cookie is light and fluffy. My kids loved them and ate them up, and I am already thinking that I need to make another batch. SO GOOD! Do you have a favorite cookie recipe? Share and leave a comment below! If you liked this post you can find more Dessert Recipe ideas in my Cookie Gallery. I may try these today. I love the orange/chocolate combination! Is the oven set to 350 degrees? I love the combination. I also love your blog title! No way, Katie!!! Orange and Chocolate Chip??? I MUST TRY THIS!! YUM!! Thanks for sharing at The DIY Dreamer… From Dream To Reality! Never heard of this combination. Sounds yummy. Thanks for sharing on “I Gotta Try That” Have a great day! Saw this link over at Manic Monday link party. I love the combo of orange and chocolate. I love this! 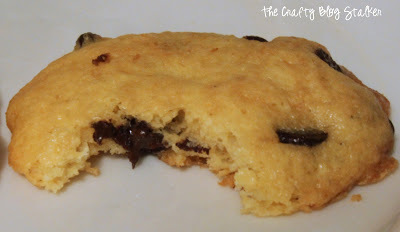 an easy cookie and with chocolate!!!! yeayyy…a dream come true! Thanks you for sharing! I’m making them for sure, Pinned!